Walking down the street in LA last night, I came across this a startling statue in the middle of the sidewalk. If you’re just the typical passerby, you’d still find the figure striking and interesting. If you’re a fan of Doctor Who, you’d find it alarming as well. Clearly this is one of the weeping angels. It’s wearing a mask to disguise itself, but I’m not fooled. For perspective, my lovely spouse doesn’t really want to watch the episodes with the angels. You know. Because of the nightmares. So, in honor of the Angels return in next week’s, er … four weeks from now’s episode of Doctor Who, for those of you watching it as the BBC demands of you, I thought I’d mention them. It looks like she’s staring into a mirror, so maybe she’s lost her power. I didn’t blink as I walked by, all the same. 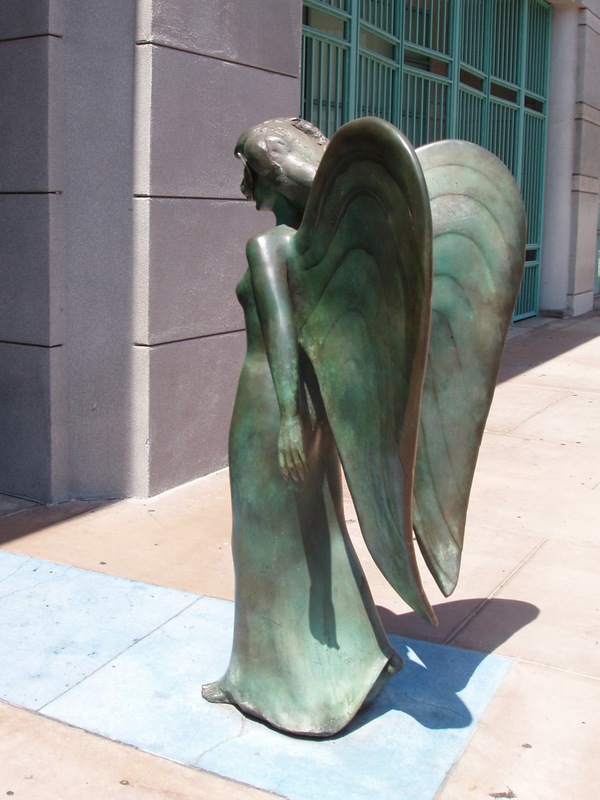 This entry was posted in Science Fiction and tagged Angels, Doctor Who, Los Angeles. Bookmark the permalink. OH WOW! That does look just like one. Don’t Blink, Whatever you do, Don’t. Blink. I would be really worried if I still lived in the City of Angels.